I saw the poster to this movie last year in a cinema, but it played only few days in the theaters that I did not have the chance to see it then. So when I saw that the cable TV channel Cinemax was going to play it on Friday night, I had reminded myself to see this. Last night, I almost forgotten about it but luckily while I was browsing through TV channel schedules, I saw that it would be playing at 9PM. Well, let us get on with the movie now. A teenage boy named Jack Bronson (Uriah Shelton - The Glades TV series, Blue web series etc) was living with his mom Annie (Sienna Guillory - Eragon, Inkheart etc). They were having some financial problems where they might be losing their house. Jack was very skillful in playing video games using an avatar of his creation called The Black Knight. Due to some reasons, Jack was somehow transported to ancient China where he met with Wizard (Francis Ng - 2000 AD, Infernal Affairs II etc) who was having great wizard skills. Jack was thought to be the great warrior Black Knight and was supposed to help save the teenaged Princess Su Lin (Ni Ni - The Flowers of War, Suddenly Seventeen etc) who was captured by Arun the Cruel (Dave Bautista - Blade Runner 2049, Guardians of the Galaxy Vol 2 and its prequel, etc) to become his bride. Su Lin had a very skilled martial art bodyguard named Zhao (Mark Chao - Black & White TV series, So Young etc) who thought that Jack was a useless person and did not believe Jack was the right savior. Jack who always thought that he was a weak person and even got bullied at school, certainly felt that he was the wrong person to help. His main intention had always been to return back to his hometown to his mother. So could Jack step up and really saved the princess whom he fell for? Find them all in this fantasy adventure movie. 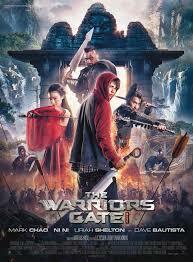 At first I thought that the movie would be a good adventure film with lots of martial arts fighting. But after completing the movie which ran for 1 hour 48 minutes, I found that the movie was a bit dull. The fight scenes only good when involving Mark Chao who seemed to be actually good in martial arts. I personally think that Uriah Shelton was not that convincing in fighting and he seemed awkward in those scenes (apart from the final scene at school that was probably more believable). Ni Ni seemed OK as a princess with not bad fight skill while Dave Bautista surprisingly was fun to see. A bit similar perhaps to his role in the Guardians of the Galaxy movies. His interaction with his right hand man Brutus was very funny (I think the only real funny scenes in the movie). Now what about the story? I do not know why but I felt there was a familiar feeling with a Hollywood-Chinese movie titled The Forbidden Kingdom where a teenage boy played by Michael Angarano was somehow transported into ancient China where he met with a monk played by Jet Li and an immortal played by Jackie Chan to help avenge a Chinese girl played by Liu Yi Fei. Sounds very familiar, right? That's why I think that this movie was not having an original plot and I believed that movie was much better than this one, especially with the major famous Chinese stars of Jet Li and Jackie Chan and the action sequences were more awesome, no doubt due to choreographed by the famous Yuen Ho Ping. As a movie that was produced by the cooperation of Chinese and French, this movie did show quite significant scenes having the very beautiful China sceneries. They were mostly having breathtaking views and indeed make me interested in enjoying the real scenery there. One thing that I felt missing from this movie was a good soundtrack. There did not seem to be any nice songs to accompany the movie, not even during the end credit scene. When I watched this movie last night, I was trying my best to keep open mind, but unfortunately I was not able to fully enjoy the movie due to its rather low quality fight scenes, or the non convincing main star's fight ability or the lack of chemistry between the male and female lead in some parts. It was a bit disappointing that the movie was not entertaining enough. So if you are looking for a good East meet West kind of movie, I recommend you to see The Forbidden Kingdom instead of this one. But if you just want to see and find out about the movie, you are welcome to see it in Cinemax Cable TV where I think it would be playing for the next week or so, The choice is yours.